Cellulite is a big foe of women (and men too) since its emergence is unfortunately unavoidable. You can get rid of it for a while but it always returns. Beside the appropriate nourishment and regular exercises we need to pay attention to skin care. Cellulite or orange peel syndrome is a condition in which the skin appears to have areas with underlying fat deposits, giving it a dimpled, lumpy appearance. Excess fat not transformed into energy is stored in the connective tissue; fat cells are surrounded by a mucous capsule, which makes fat reduction and metabolism more difficult. Water accumulates and the connective tissue becomes edematous. Cellulite is most noticeable on the buttocks and thighs. Although cellulite can affect both sexes, it is much more common in females, mainly because they are more likely to have particular types of fat and connective tissue. 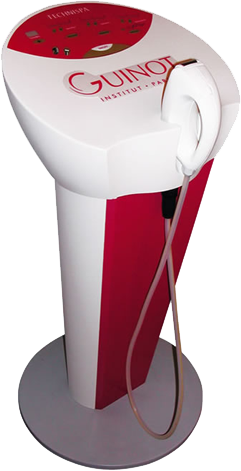 Guinot TechniSpa treatment provides you guaranteed weight loss and decreases your circumference by 4-5 cm during a 6-10 session treatment. Cellulite gets barely visible after 1-2 treatments. Using a lypolitic gel we massage and scatter the cellulite, kick-starting the blood circulation and the lymph flow in the connective tissue. We ionize the skin – at the same time with the vacuum massage - with a firming gel to achieve the perfect effect. This double function of Guinot TechniSpa is exceptional on the beauty market. Muscles are forced to contract and calories are burnt by this means. Muscles get tight, the micro circulation increases and toxins go off from the system. In case of a 10 session treatment we give you a Guinot slimming cream for FREE.